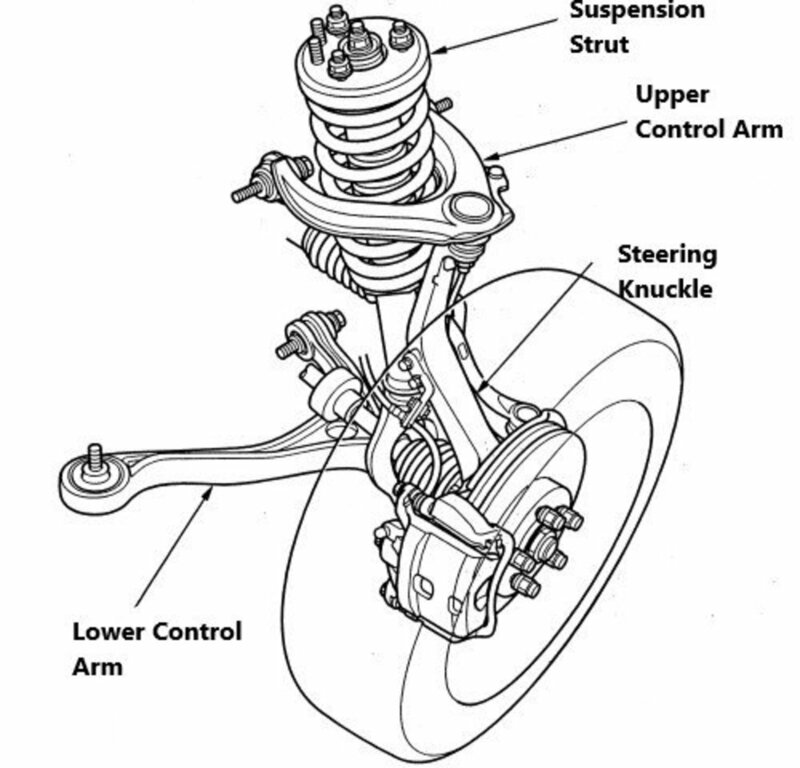 In a typical Toyota or Lexus sedan that uses the McPherson automotive suspension design, the suspension includes the following components: the strut, the lower ball joint, the lower control arm, and the sway bar link or stabilizer link (shown below). 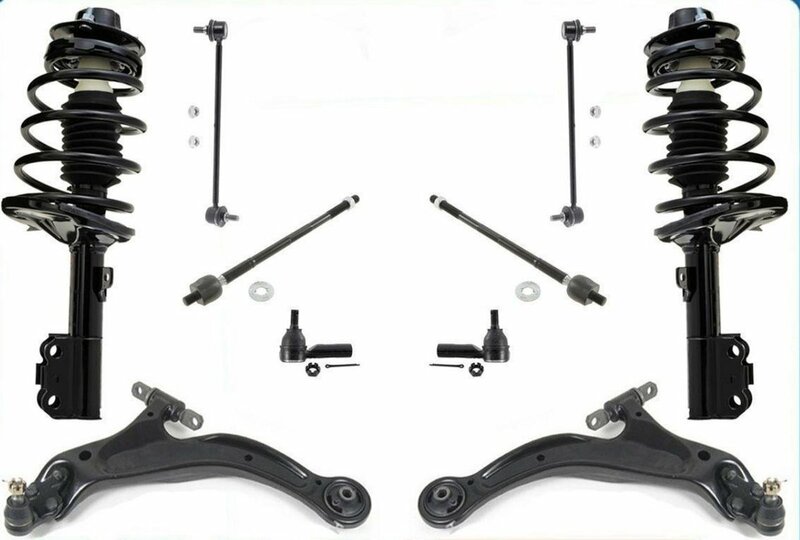 Rather than replacing individual suspension components as needed, it may be cost-effective on a high-mileage car for the car owner to replace all the wear components of the suspension to save on future labor costs and avoid repeat visits to the repair shop. This 24-minute video will provide you with a visual step-by-step process for performing the repair. If text-based instructions are desired, they are outlined below the video presentation. Remove the sway / stabilizer bar link from the strut using a combination of a hex socket to hold the shaft of the link from turning and a box wrench to twist off the nut. Spraying with penetrating oil makes the process easier. Remove the ABS electrical bracket from the fender well. Disconnect the brake line and ABS bracket from the strut. Remove the two (2) nuts and bolts that attach the strut to the steering knuckle. If a high-torque impact driver is not available, I recommend using a breaker bar due to the high tension on the nuts. Wiggle the strut away from the steering knuckle until it is detached. 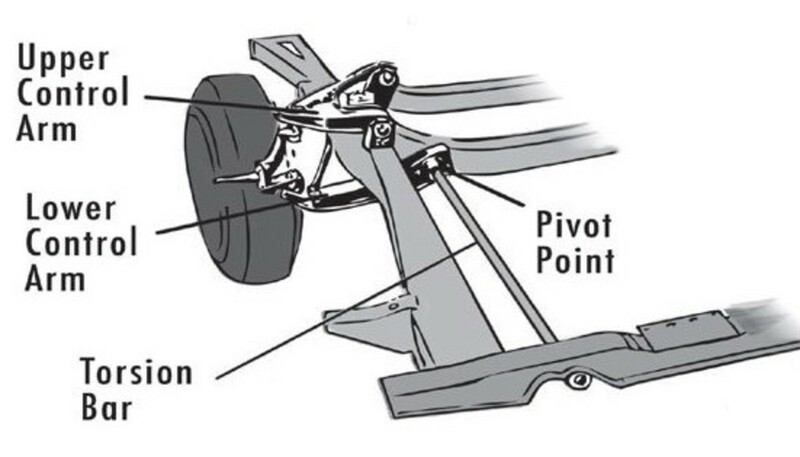 A pry bar placed between the strut and steering knuckle can help detach it. 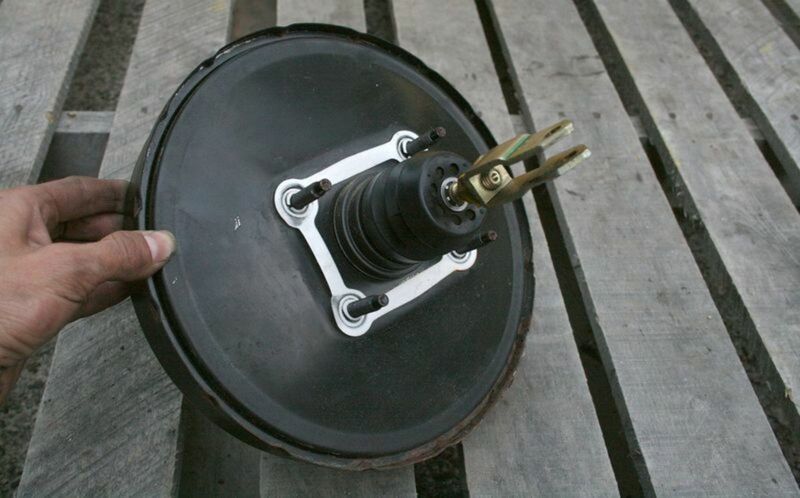 Remove the three (3) nuts that secure the upper portion of the strut to the strut tower or chassis of the car. Before removing the last nut, put a hand under the strut to hold it, so it doesn't drop down. Now the strut can be removed. Unbolt the two (2) brake caliper bracket bolts that secure the caliper assembly to the steering knuckle. The assembly can then be placed on the ground. If there is too much tension on the brake line, support the assembly with something (a wooden or metal box, stand, etc.) to keep the tension off the brake line. Remove the brake rotor. If the rotor is rusted in place, either apply hammer blows between the wheel lugs to vibrate it loose, or use a 12-mm bolt and screw into one of the two rotor holes until the rotor pops free from the wheel hub. Detach the tie rod end from the steering knuckle. Remove the cotter pin and tie rod end nut. Apply hammer blows to where the knuckle attaches to the tie rod end. The vibration will eventually cause the tie rod end to break free. Remove the cotter pin from the upper portion of the lower ball joint. Remove the cotter pin from the CV axle nut and then remove the CV nut castle cup. Using a 30 mm 12-point socket, remove the CV axle nut with an impact tool (either air, electric or manual). If not available, prevent the wheel hub from moving by placing a long pry bar between two of the wheel lugs and securing the other end of the pry bar on the ground. Use a breaker bar to generate the torque needed to loosen the CV axle nut. Detach the outer portion of the CV axle from the steering knuckle. Apply light hammer blows to the CV axle. If the axle will not move through the wheel hub, use a metal punch tool—not a hammer—to push it through without damage the threads of the CV axle. Pull the CV axle out of the steering knuckle and wheel hub. Remove the CV axle dust shield. The dust shield can be pried off with either a small pry bar tool or screwdriver. Since the shield is flimsy, work around it until it pops off. Remove the top nut that secures the steering knuckle to the ball joint. Detach the ball joint from the steering knuckle. Apply hammer blows to the where the ball joint shaft meets the steering knuckle. The vibration will free the ball joint from the steering knuckle. Detach the ABS sensor from the steering knuckle. Support the CV axle above the suspension components with either a rope or rubber strap. Remove the two (2) horizontal bolts that secure the front the control arm to the subframe of the car. There is a washer on the rearmost bolt that must be transferred to the new control arm. Remove the rear bolt of the control arm from the bottom. The top nut must be held in place with an open-end wrench to prevent the nut from spinning. Once the bolt has been removed, the nut can be removed with a telescoping magnetic pickup tool. If installing a new sway / stabilizer link, detach the link from the sway bar using a hex socket and a box wrench. Transfer the washer from the old control arm to the new control arm. Wiggle the rear portion of the control arm into the control arm bracket and line up the holes. You can use a large screwdriver or other round metal tool to align the holes. Install the rear bushing bolt through the control arm bracket and control arm bushing. You may need to get under the car to get a good line of sight for alignment. Push or screw in the control arm bolt until flush with the top of the control arm bracket. Using a telescoping magnetic pickup tool, attach the control arm's bolt nut and position it above the control arm bolt. Turn the control arm bolt until the threads catch the nut threads. Remove the magnetic pickup tool and hold the nut in place with an open-end wrench. Torque down the control arm bolt to but no all the way. 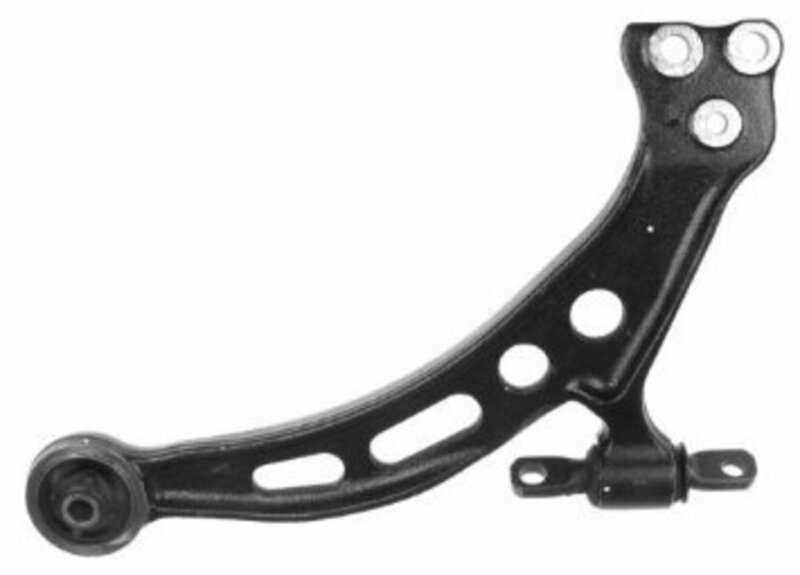 The front control arm must swing forward in order to attach the two front control arm bolts. Install the two front control arm bolts. Ensure the rear bolt has the washer transferred from the old control arm. To prevent cross threading, move the control arm up and down while hand-screwing the bolts. After thread contact, tighten the bolts down. If no impact driver is available, use a breaker bar to apply the final torque. Apply the final torque to the rear control arm bolt. If no impact driver is available, use a breaker bar to apply the final torque. Attach the new sway (stabilizer) bar link to the sway bar. Mount the steering knuckle to the new ball joint shaft, attach and torque down the new castle nut, line up the cotter pin hole and install the new cotter pin. Re-attach the CV dust shield and bolt on the ABS sensor. The dust shield hole should line up with the ABS sensor. The dust shield ring can be pressed in with a hammer and a wrench socket by gently hammering around the interior ring of the dust shield until flush with the steering knuckle. Insert the CV shaft into the steering knuckle and align it with the splines in the wheel hub. Apply penetrating oil to ease the process. After the CV shaft has passed through, screw on the CV axle shaft nut. Torque down the CV axle shaft nut with a 30-mm 12-point socket. Use an impact driver to apply the final torque. Alternatively, prevent the wheel hub from moving by placing a long pry bar between two of the wheel lugs and securing the other end of the pry bar on the ground. Use a breaker bar to generate the torque needed to tighten the CV axle nut. Install the castle nut washer aligned with the cotter pin hole and install the cotter pin. Position the top portion of the strut into the three holes of the strut tower or chassis. Hand tighten the strut nuts. Apply the final torque later to allow a little wiggle room for connecting the lower portion of the strut to the steering knuckle. Push the steering knuckle into the strut mounting points. Wiggle the steering knuckle with the strut until the holes line up. Push through the two strut bolts then screw on the strut nuts. Torque down the top strut nuts. Torque down the lower strut nuts and bolts. Install the brake rotor. Hold the rotor in place with one lug nut. Install the brake caliper assembly. 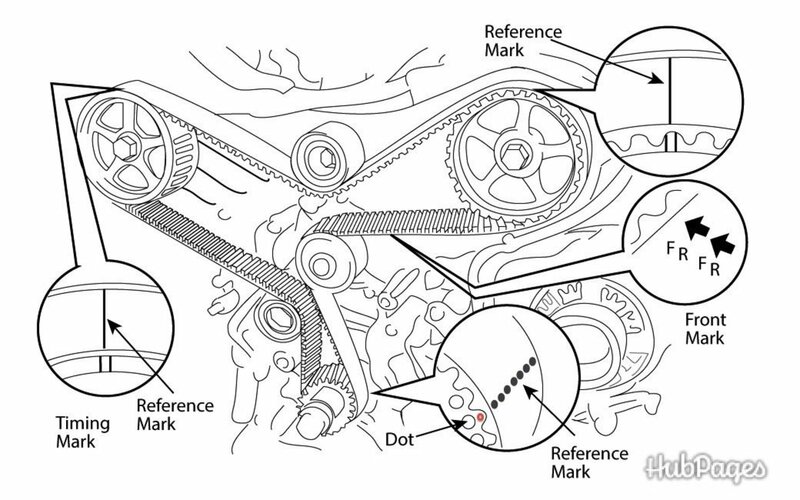 Wiggle the caliper assembly onto the rotor so that the gap between the brake pads works its way onto the rotor. Line up the caliper bracket with the mounting points on the steering knuckle and install the two caliper bracket bolts. Connect the tie rod end to the steering knuckle. Screw on the tie rod end nut. Torque down and install the cotter pin. Connect the sway / stabilizer bar link to the suspension strut. Connect the brake line and ABS line bracket to the suspension strut with the 12 mm bolt. Connect the ABS line bracket to the fender well with the 10 mm bolt. 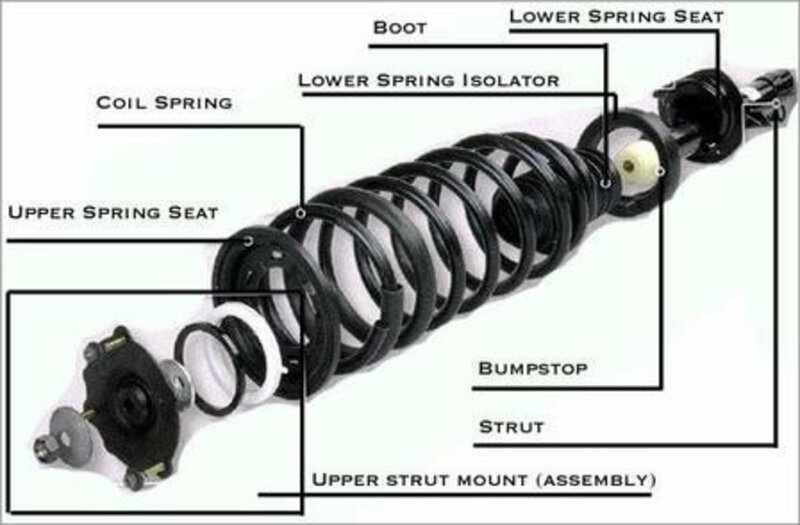 what is a sub suspension frame? It is a frame that supports both the engine and transmission separate from the car's chassis. The frame can then be attached or detached from the chassis of the car.